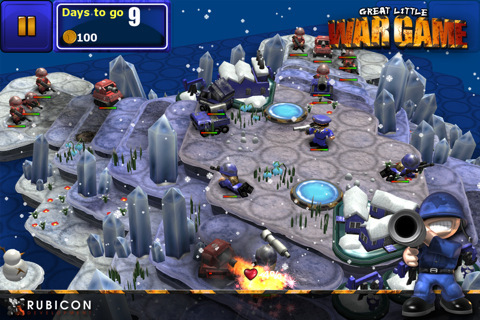 Great little war game HD is an awesome turn based strategy game for the iPhone, iPad and iPod touch. If any of you have ever played advance wars then you would be very familiar with Great Little War Game’s engine. Now when I say Great Little War Game is a great little war game, I mean every word of what I say. The only problem I had with this app was my iPod dying multiple times on me from playing too much. Rubicon Mobile or Rubicon Development’s GLWG (Great Little War Game) is an awesome turn base game that not only requires more brains but also shows some brawns. I reviewed the HD version, but there is also a normal version in the app store for about a dollar cheaper. There is also a free version for both HD and normal. I probably wouldn’t recommend the HD version anywhere away from an outlet if you know what I mean. The colors and graphics are very good. After awhile I had to start playing this app with my charger plugged in. The visuals are very colorful, animations are fluent, and there is a lot of movement even when units are idling. This is probably one of the reasons that the game eats up battery life so quickly. But then again, there is really nothing Rubicon or Apple can do about it outside of inventing a battery upgrade. The controls are as simple as tapping a unit, and tapping again to move them. There are some things that probably should be changed like training multiple units. You can only train one unit at a time because they can’t overlap over each other when spawned. It took me some time to figure out that I had to have them walk away from the spawn point to train another. Another small problem that I didn’t mind much was the combination of flying units and land units sharing the same location. Soon after you deploy land units; it’s a bit difficult to highlight them because there is a giant helicopter right above them. Probably adding in a camera rotate function would quickly solve this. Great Little War HD isn’t long but it’s not necessarily short for an iOS app. In fact, most missions would probably take you around twenty to thirty minutes to complete. And being that there are about twenty missions, you do the math. There are many special types of units that are automatically unlocked as you progress through the game. Ironically, the grenader can be unlocked by giving the app a review, but being devoted to my job I decided to do this review before unlocking the grenader. And that is why I am here writing this review. I really want to just end this review with a rating and just go back to playing, but I would probably be fired before I knew it so here’s my conclusion. Great Little War Game HD can be found in the app store for an awesome $2.99. It’s currently on sale down from $4.99 so go check it out asap if your into turn based games. The non HD version is one dollar cheaper so it’s at $1.99. I enjoyed this game a lot, and plan on finishing it within the day. GOOD GAME, TABLE FLIP!!! 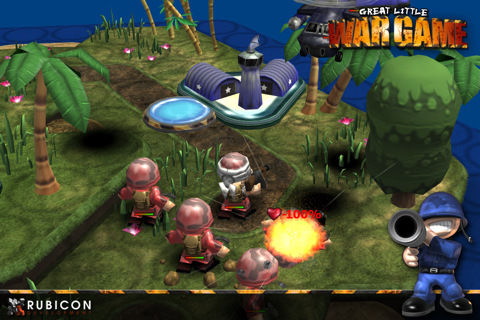 AppSafari review of Great Little War Game HD was written by Vincent Tam on July 18th, 2011 and categorized under Action, App Store, Games, iPad apps, Resource Management, Strategy, Universal. Page viewed 6683 times, 1 so far today. Need help on using these apps? Please read the Help Page. Just thought I’d point out that the game is currently down to $0.99 for a limited time, so there’s every reason to snap it up quick!